An unaltered photocopy of your DD-214 other military issued document clearly displaying your award of the Joint Service Commendation Medal. Description: On a device consisting of 4 conjoined hexagons, 2 vertically and 2 horizontally, of green enamel, an eagle with outspread wings charged on its breast with the shield of the United States and grasping in its talons 3 arrows (as depicted on the seal of the Department of Defense) all in gold between at top 13 gold stars and in base a gold stylized heraldic delineation representing land, sea and air, all within a gold circular laurel wreath bound with gold bands 1 5/8 inches (4.13cm) in diameter, and with the areas between the inside of the wreath and the device pierced. Symbolism: The four hexagons (representing the Army, Navy, Air Force and Marine Corps Commendation Medals) are joined to symbolize the joint service nature of the award as does the stylized heraldic delineation representing land, sea and air. The eagle, shield of the United States, arrows and thirteen stars are taken from the seal of the Department of Defense and refer to the medal being awarded in the name of the Secretary of Defense. The gold laurel wreath and gold color signify achievement and award. The color green is symbolic of faithfulness and unity. Ribbon: A ribbon 1 3/8 inches (3.49cm) in width, composed of a 1/4 inch (.64cm) Bluebird stripe, a 1/8 inch (.32cm) White stripe, a 3/32 inch (.24cm) Myrtle Green stripe, a 1/8 inch (.32cm) White stripe, a 3/16 inch (.48cm) Myrtle Green stripe, a 1/8 inch (.32cm) White stripe, a 3/32 inch (.24cm) Myrtle Green stripe, a 1/8 inch (.32cm) White stripe and a 1/4 inch (.64cm) Bluebird stripe. Symbolism: The green (same shade as the green enamel on the pendant) and white stripes of the ribbon were suggested by the ribbons of the Army and Navy Commendation Medals. The broad stripes of blue (Bluebird) flanking the white and green stripes refer to the Department of Defense. Background: a. 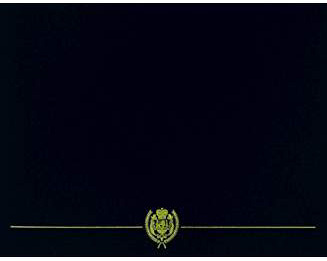 Authorized by the Secretary of Defense, June 25, 1963.
b. The JSCM shall be awarded only to members of the Armed Forces of the United States who, after January 1, 1963, distinguished themselves by meritorious achievement or service. c. The JSCM shall be awarded in the name of the Secretary of Defense. (a) The DA&M, OSD, or designee, for awards to Service members assigned to the OSD; the DoD Field Activities; The joint-DoD activities that report directly to an OSD Principal Staff Assistant or for which the Secretary of a Military Department has been designated as an "Executive Agent"; the multilateral and bilateral organizations; and the other offices in the Executive Branch, Executive Agencies and Departments, or independent establishments and Government corporations. (b) The Director, Joint Staff, for Service members assigned to the Joint Staff and to those joint activities reporting directly to or through the Chairman of the Joint Chiefs of Staff, or the Joint Staff, that are not delegated approval authority. (c) The CINCs of the Unified or Combined Commands for Service members assigned to their respective Headquarters or joint activities directly under their operational control. They may also approve that award for the commander, his or her staff, and other Service members attached to a JTF as individuals (not as members of an assigned and/or attached unit). (d) The Supreme Allied Commander, Europe; the Supreme Allied Commander, Atlantic; the U.S. Representative to the Military Committee, NATO; the Defense Advisor, U.S. Mission NATO; and the CINC, NORAD, for Service members assigned their respective commands or associated Agencies. (e) The Directors of Defense Agencies (except NARPA and the DSAA), for Service members assigned to their respective Agencies. (f) The Commander, U.S. Forces Korea, for Service members assigned to their headquarters and to those joint activities reporting directly to that command. (g) The President, NDU, for Service members assigned to the University, National War College, Industrial College of the Armed Forces, and Armed Forces Staff College. (h) The Commandant, Armed Forces Staff College, for Service members assigned to the College. (i) The Executive Director, Military Postal Service Agency, for Service members assigned to his or her Agency. (2) That authority may be delegated further at the discretion of the awarding authority to general or flag officers of the Armed Forces of the United States in the grade of O-7 or civilian equivalent, when they occupy established command or staff positions. Such authority must be delegated in writing. d. The JSCM shall take precedence with, but before, the Service Commendations Medals. A bronze "V" is authorized if the citation is for an act or service involving direct participation in combat operations during the period June 25, 1963 to March 31, 1976. Effective April 1, 1976 the "V" device is authorized if the citation is approved for valor (heroism) in a designated combat area. e. Recommendations for the JSCM shall be submitted to the appropriate approval authority for processing. In those instances where the approval authority rests with the DA&M, OSD, or the Director, Joint Staff, the recommendation shall be submitted for processing to the Chief, Military Personnel Division, Personnel and Security Directorate, WHS, of the Joint Staff no later than 90 days before the desired presentation date. 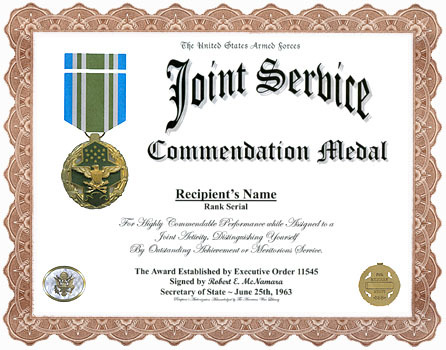 The Joint Service Commendation Medal was established by Secretary of Defense Robert E. McNamara on June 25, 1963. The Joint Service Commendation Medal has been effective since January 1, 1963. 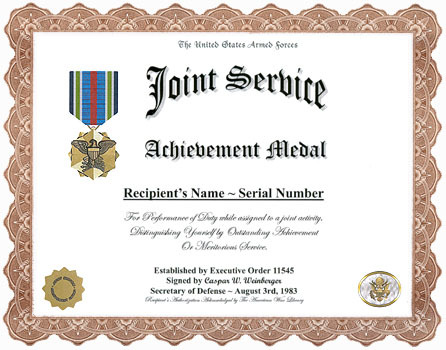 The Joint Service Commendation Medal is awarded in the name of the Secretary of Defense to members of the Armed Forces who, while assigned to a joint activity, distinguish themselves by outstanding achievement or meritorious service, but not to an extent that would justify award of the Defense Meritorious Service Medal. The Joint Service Commendation Medal is worn after the Air Medal and before the Commendation Medals of the separate services. Additional awards of the joint Service Commendation Medal are denoted by oak leaf clusters, except in the case of the Coast Guard. Until 1998, additional awards to Coast Guard personnel were denoted by a gold star five-sixteenths of an inch in diameter. In 1998 the Coast Guard authorized its members to wear the oak leaf cluster on this decoration to denote subsequent awards; however, previously authorized gold stars will continue to be worn. The bronze "V" device may be worn on the suspension ribbon of Joint Service Commendation Medal when it is awarded for acts or service involving direct participation in combat operations on or after June 25, 1963. The Joint Service Commendation Medal was designed by Stafford F. Potter of the Army's Institute of Heraldry. The first recipient of the Joint Service Commendation Medal was Lieutenant Colonel Bruce F. Meyers, USMC, who received the medal in 1963. The medal consists of four conjoined hexagons (two vertically and two horizontally), of green enamel edged in gold. The top hexagon is charged with thirteen gold five-pointed stars (point up), and the lower hexagon has a gold stylized heraldic delineation. In the center of the conjoined hexagons is an eagle with its wings displayed horizontally and with a shield on its breast. The eagle is shown grasping three arrows in its talons. The conjoined hexagons are contained within a circular laurel wreath bound with gold bands. The areas between the gold band and the re-entrant angles of the hexagons are pierced. The conjoined hexagons represent the unity of the Armed Forces in providing for the National defense. The eagle is taken from the Seal of the Department of Defense and represents the authority under which the award is given. The thirteen stars allude to the thirteen colonies and hence all of the States; however, since the star also represents the military, the configuration of stars also represents the military tradition of the United States. The heraldic delineation in the lower hexagon represents land, sea, and air, and the laurel wreath represents achievement. In the center of the medallion there is a plaque for engraving the recipient's name. Above the plaque in two lines are the raised words, FOR MILITARY and below the plaque, MERIT. There is a laurel spray below the word MERIT. The inscription and laurel spray are taken from the Army and Navy Commendation Medals. The ribbon consists of a center stripe of green bordered by stripes of white, green, white, and light blue. The green and white are adapted from the colors of the Army and Navy Commendation Medals and the light blue represents the Department of Defense.